Hercules club’s other common names include prickly ash, southern prickly ash, toothache tree, sting tongue, and wild orange. Zanthoxylum clava-herculis is a native tree in the Rutaceae, or citrus, family. 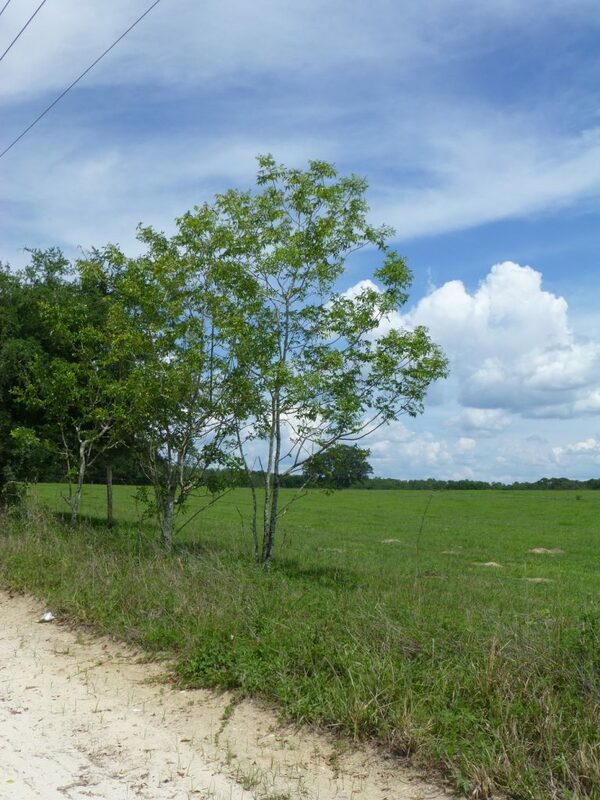 It is a craggy looking tree that grows in a variety of habitats from hammocks, wet woods, sand dunes, shell middens, sandy hammocks and fence rows. The branches and trunk have large spines and with maturity the trunk’s thorns develop thick cushions of cork giving the tree a gnarled and spiky look. 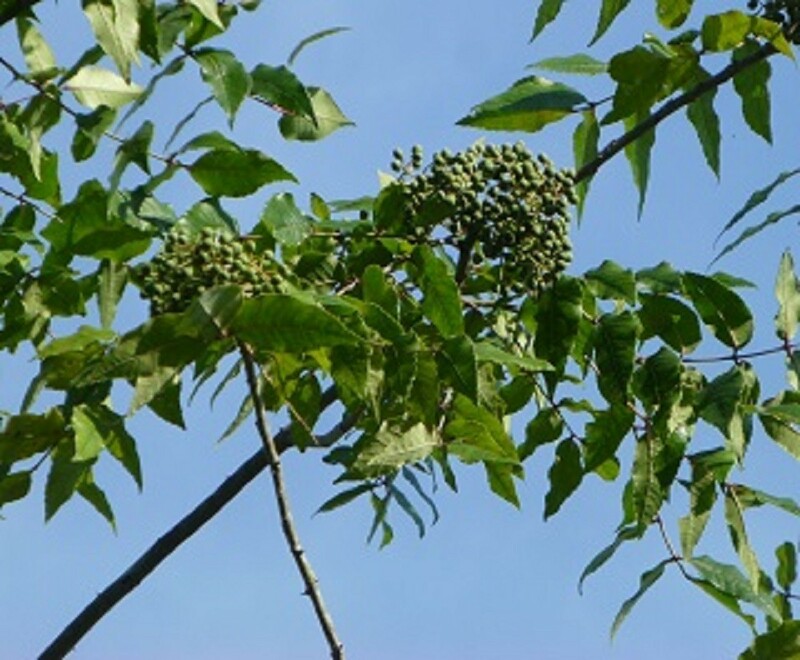 The alternate and pinnately compound leaves grow to about a foot in length. 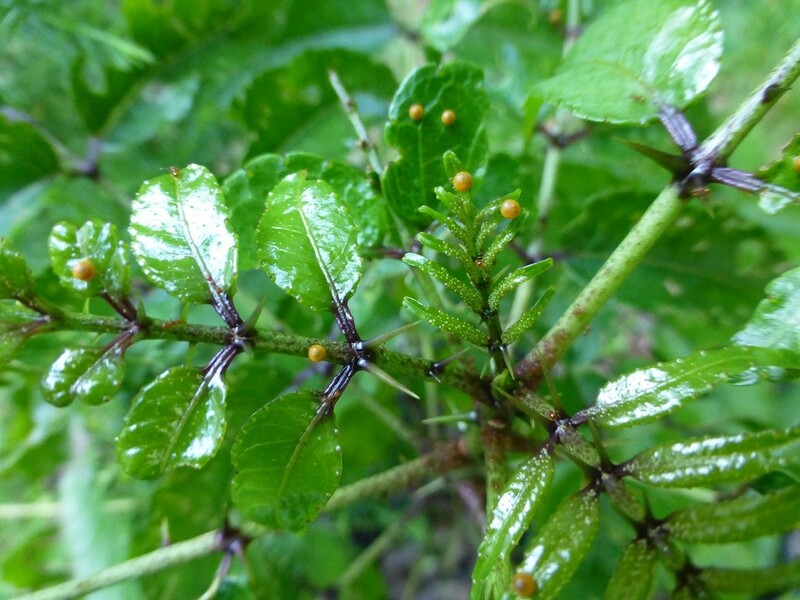 The rachis (stem) of the leaves has sharp thorns. The leaflets can be from seven to nine in number and occasionally as many as twenty. The leaves are dark green above and glabrous (smooth) below. The margins are crenate (with rounded teeth). The spines can leave a very sore spot if one is punctured by them. The site generally swells and is very sore. It generally leaves small spots where the puncture wound originally occurred. If pressure is applied a clear fluid exudes and some relief is achieved and within several days the wound will heal. Hercules club blooms in the spring. The flowers are born in large clusters at the ends of the branches. The flowers are greenish yellow to greenish white in color. The flowers provide a nectar source for many pollinators. Fertilized flowers produce round, green, fruits that once mature split open to partially expose an ovoid shaped, black fruit. The fruit is eaten by songbirds. Hercules club is dioecious (male and female flowers are separate trees) so unless one has others nearby several specimens should be planted. 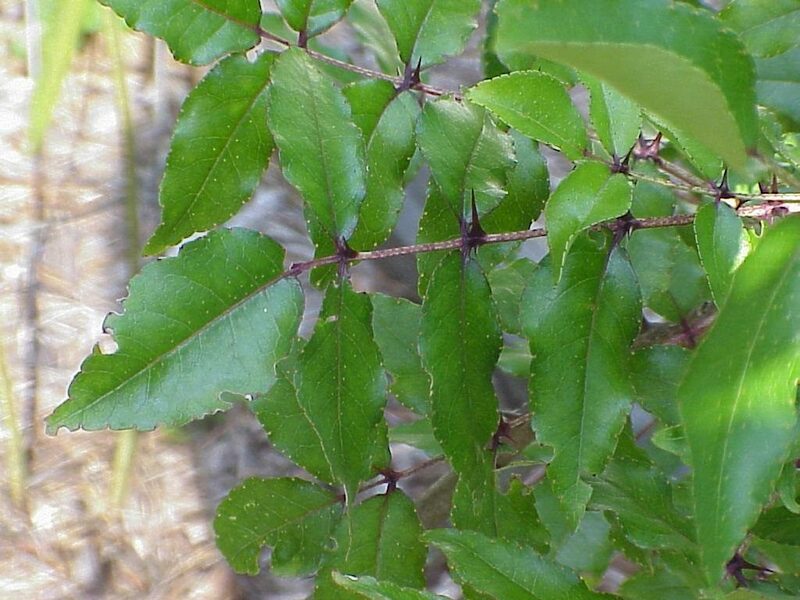 Zanthoxylum clava-herculis had, and has, many medicinal uses. 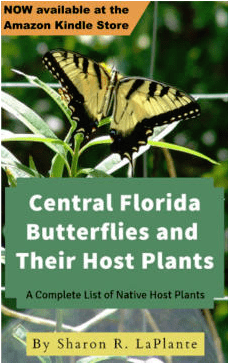 It is a larval food plant for the giant swallowtail butterfly. 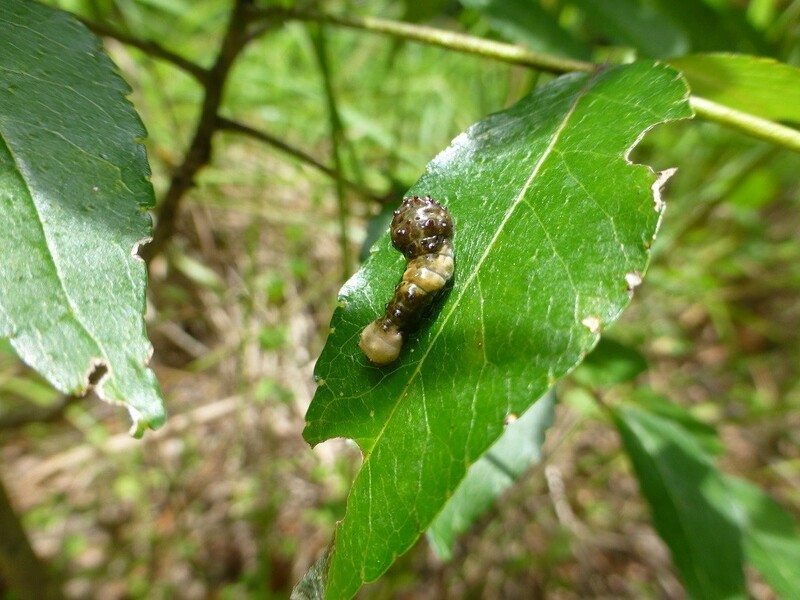 The female butterfly lays her eggs on the new growth and the hatching caterpillars eat the leaves until they are large enough to pupate. The caterpillar generally moves away from the host tree to pupate. Propagation is achieved through seeds, semi-hardwood cuttings, and transplanting small specimens. The seeds need to be cold stratified for 2 to 3 months and then scarified, and soaked overnight before planting. Hercules club seeds for sale at Sharon’s Florida store. Godfrey, Robert K. Trees, Shrubs, and Woody Vines of Northern Florida and Adjacent Georgia and Alabama. Athens: University of Georgia. 1988. Print. Austin, Daniel F. Florida Ethnobotany Boca Raton, FL: CRC, 2004. Print. Foster, Steven, and James A. Duke. A Field Guide to Medicinal Plants: Eastern and Central North America. Boston: Houghton Mifflin, 1990. Print.